Laura Matthew on the secret life of primary sources and the responsibility historians have to them, and to each other, when documenting the past. I have been thinking about how documents are lost, then found. Little did I know. 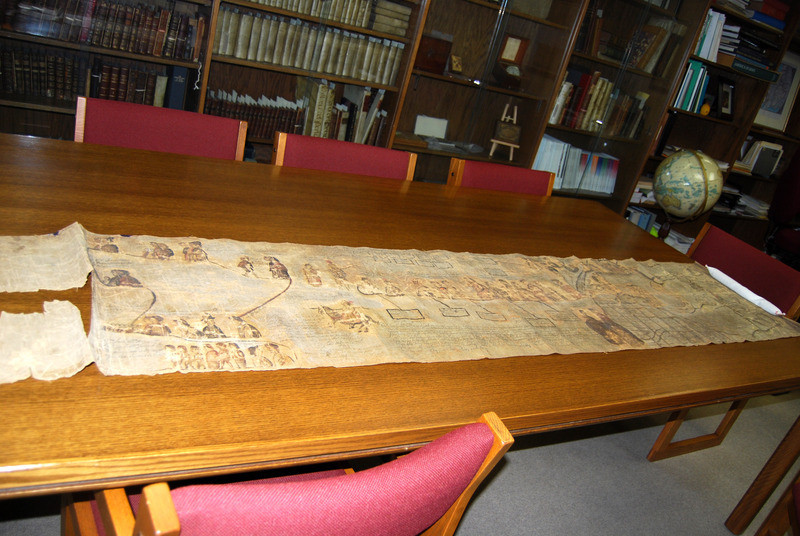 A few days later, Jovanka Ristic and Kay Guilden at the AGS Library unrolled in front of me a piece of bark paper on textile, about six feet long and two feet wide. The document had the characteristic look of an indigenous land title from Mexico’s mid-colonial period, a mix of traditional pictographic narration and alphabetic text. Two sections in Spanish told me that the document dated from 1691-1709, and came from Santa Catharina de Tepexi. The rest of the text looked oddly like Zapotec – odd, because Tepexi is in the current state of Puebla, whereas Zapotec is spoken further southwest in Oaxaca. Since I am no expert in indigenous languages (nor, as it turns out, in Mexican geography), this was as far as my observations could take me. But I knew who could take it further. The next day I wrote my friend and colleague Michel Oudijk at the Universidad Nacional Autónoma de México. Michel and I co-edited a book together in the mid-2000s. He studies ancient Zapotec history through the pictographic writings of the colonial period. He also wrote a book on the leader of Tepexi, Puebla, during the conquest period. “Hey Michel,” I wrote, “there’s this document here in Milwaukee….” I described what I’d seen, and sent some pictures the librarians had provided. “Wooooooooooooooowwwwwwww, Es el Códice de Santa Catarina Ixtepeji!!!!!!!!!!!!!!!!!!! !” came the response in my email a day later. (Again, a direct quote). As it turned out, Michel and his friend and colleague Sebastián van Doesburg had been searching for this document for over a decade, in archives throughout Mexico, Europe, and the United States. It is not from Tepexi in Puebla, but from the Zapotec town of Santa Catarina Ixtepeji in Oaxaca. Sebastián had even published an article on the document in 2000, based on a grainy black-and-white photograph of the document’s left-hand corner from the 1950s that he had found in the National Anthropology Museum in Mexico City. Scholars writing in the 1960s reported that a document on leather from Santa Catarina Ixtepeji had been sold to a German consul in the early twentieth century. The scholars included this information in their catalogues of pictorial manuscripts from Mexico, with the hope that someday, somewhere, a document that was once seen would resurface. (Sebastián’s research suggested that in fact there may have been two lost documents from Santa Catarina de Ixtepeji. The second, it seemed, was sold by a British consular official in Oaxaca named Rickards, a Mexican of Scottish descent, from his private collection. This is the document at the AGS Library). I rode the bus home that afternoon with a big, goofy smile on my face. I will not use the once-lost Códice de Santa Catarina de Ixtepeji in my own research – but I know exactly how excited Michel and Sebastián were feeling at that moment. I know, because last year I got an email from my friend and colleague Christopher Lutz, informing me that Sebastián van Doesburg had found the lost city council books of the first successful Spanish capital of Guatemala. Those books, dating from 1530-1553. had been stolen and sold from Guatemala sometime in the last decade of the nineteenth century. At the time, Sebastián was doing research in the Hispanic Society in New York City. The archivist there asked him to look at these books. Sebastián looked, and though it wasn’t his area of research, knew they were important. He wrote Chris, and voilá. A century-long mystery solved, an incalculable resource for the history of Guatemala returned to the scholarly community. The “lost” cabildo books are currently being transcribed for publication by a Guatemalan team of historians. I rode the bus with a big, goofy smile on my face that day, too. There is an unpleasant side to this tale. Countless pieces of Mesoamerican history are scattered throughout Europe and the United States, as a consequence of direct or indirect imperialism and the power of the purse. Antiquities-hunting became something of a craze in the nineteenth century. Dealers scoured indigenous villages for old stuff they could sell to the highest bidder, often a foreign business magnate with a penchant for collecting. Scholars also bought, copied, and “borrowed” manuscripts. Sometimes things were simply taken. And this swindling continues. In 1995, the politically-appointed president of the national archives in Guatemala sent his wife to sell sixteenth-century documents to Swann Gallery in New York City. Oftentimes, these precious pieces of the past end up hanging on someone’s living room wall or tucked away, “lost,” in an unorganized bundle sold or donated to a library after the buyer’s death. When I once found a document signed by the famous conquistador Bernal Díaz de Castillo in the Guatemalan archives, I sat in satisfied awe for a few moments at my desk. But I was careful to mention it only to a few trusted Guatemalan friends and colleagues. A document with Díaz del Castillo’s signature currently goes for $125,000; royal decrees from seventeenth-century Guatemala go for $30,000. But today, I can’t keep the smile off my face. I have repeated the mantra “friend and colleague” because even though research and writing can be solitary, it also means being part of a community. Friends and colleagues, librarians and archivists, all share time together in the archive. We share ideas about what we find, and the challenge of writing about it in some coherent, convincing way. We also share information, and each other’s joy at finding a key fragment of the past that was once lost. When one of those fragments is recovered, so is piece of history. It’s why we do what we do, and there are few moments that are quite as satisfying. Update: AGS curator emeritus Christopher Baruth has discovered that the Códice was sold to the AGS in 1917 by a mining engineer, A.E. Place. Baruth suspects that Place had bought it from the private collection of Rickards, whose family was also involved in the mining industry. Laura Matthew is an assistant professor of Latin American History who specializes in colonial Guatemala. Her first book, Memories of Conquest: Becoming Mexicano in Colonial Guatemala will be coming out soon (Spring 2012) through the University of North Carolina Press. I am so jealous of you. As a lowly undergraduate, doing something like this is a dream of mine. Absolutely wonderful! Even I have a big, goofy smile on my face right now, at the very idea. I also like the Historians@Work blog. Very smart. Hurray for libraries and librarians everywhere! Just like Oaxaca, you never know what you will find when you turn a corner in a library or archive. And, whether its wandering the streets or roaming the aisles, we can’t help but learn a little more about our world and ourselves. We need more occasions for big, goofy smiles. Don’t let your community cut funding to libraries.